Now that three of the moons of our solar system’s gas giant planets have been said to have subsurface oceans, it’s time to take stock and consider the meaning of these analyses. Ganymede and Europa of Jupiter along with Enceladus of Saturn are likely to have oceans far below their frozen surfaces. Should we send unmanned missions to explore these unusual moons, and what should we be searching for? Many have exclaimed that we have extremophiles (organisms that survive in extreme environments) here on Earth, so we cannot discount the likelihood of life beneath miles of ice where the Sun never shines. Enceladus’ north polar region. This image was catalogued by NASA’s Jet Propulsion Laboratory. If we search near the geysers of Enceladus, might we find the frozen remnants of miniature fish coughed up from deep down inside this odd moon? Answering this question requires more than a moment’s thought. What is life? How does it begin and advance? Are the ingredients for life available in those cold, deep seas? Here’s my definition. Life uses available energy and materials to reproduce itself and has the potential for errors in reproduction that will allow for evolution. From what we know, those vast, cold underground oceans have the necessary ingredients. Without an energy source, they would be frozen and not liquid. Heat coming from the inside of a moon must provide chemicals that can both be used as chemical energy sources and as materials for constructing living organisms. The liquid water is crucial. Sure, we can imagine life without water in, say, a methane sea. However, water’s outrageous abundance combined with so many unusual chemical and physical properties means that it’s the best medium for creating life, at least in the timeframe of the existence of our solar system moons. This thought immediately leads to the next. How long does it take for life to start and to evolve into unicellular forms? The very first self-reproducing materials could not have been cellular because cells require too much organization. Just look at the simplest cell and try to imagine how it would have formed, what steps are required. Too many for it to be the first evidence of life. Once the first self-reproducing molecule or set of molecules develop, how long will it take until they advance to greater complexity? It didn’t take all that long on Earth. Estimates range from several million years to something well short of a billion years. Then, things slowed enormously as some two billion years passed before oxygen-creating cyanobacteria appeared. Oxygen in the environment changed everything. It poisoned most of the existing species, some of which were hidden in oxygen-free locations and survived to be the ancestors of today’s anaerobic bacteria. It also provided a new metabolic pathway that is much more efficient than any anaerobic metabolism. The aerobic organisms that were spawned from this great oxygen poisoning led to multicellular life. None of the multicellular organisms we find are multicellular. We can be certain that underground seas will not spawn any cyanobacteria. The distance from the Sun ensures that this development would be extremely unlikely even were the seas not miles under ice. Temperature also has an impact. Few people realize that chemical reactions slow down a great deal as temperature drops. They slow by a factor of two for every ten degrees Celsius drop. A drop of 20 degrees means everything goes four times more slowly. 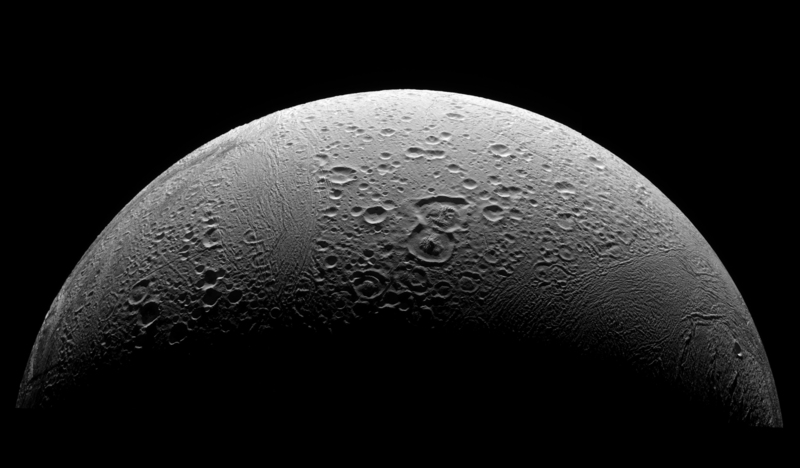 You can bet that those deep seas on distant moons are cold, near freezing except at a few isolated hot spots. To develop, life must have lots of time and space. It’s not the likeliest of scenarios, after all. Both time and space provide more opportunities for a variety of reactions. Once some reaction takes place near a hot spot, it moves upward by convection into cold waters. All of this sounds terribly dismal, but it’s really not for us — only for the hope of advanced life on those moons. Right now, scientists are debating how life started on Earth (or maybe on Mars if you read my stuff). We just don’t have a way to look back that far and see individual molecules beginning to reproduce. Those molecules have long disappeared, having been eaten by evolving cells or destroyed by ordinary decomposition due to heat, ultraviolet light, or chemicals. These moons could be our window into how life developed. Sending a robotic mission to the geysers on Enceladus, for example, could result in us finding the first steps of life sitting right there on the deeply frozen surface of that Saturnian moon. It’s even possible that drilling into that surface could return samples of the first inklings of life over a long enough period of time to show, layer by layer, step by step, how life can develop. It’s a long shot for sure, but the impact of such a discovery will be tremendous. We have to try. The only question is whether scientists will send probes that can find this evidence or whether they will be searching for more Earth-like species, for cells that may not appear for another few billion years on those very slow cookers of life. Governments have other pressing concerns (wars mainly!) which basically means everything moves very slowly. Countries like India and China are doing things that everyone has done before and so there is no hope of them doing anything meaningful. Thank you for your comment, Ani. Such a visit by a lander would not be soon. That’s for sure. We are already spending lots of money at CERN and on other large science projects. An appropriate mission to one of these moons would not bust any budget and could answer one of our most fundamental scientific puzzles. Of course, it might not. The mission would have to be designed to obtain other valuable information as well so that failure in one aspect would not cause the entire mission to be worthless. My concern here is that a mission might be sent without the capability to detect proto-life. Just because we don’t know what such life will look like or what its metabolism is like provides no good reason to avoid looking. We have the technology to get there. Someone is probably planning such a mission right how, subject to approval and funding. They should do it right. I may not have made it sufficiently clear in my article that the value of a mission to one of these moons could provide truly earthshaking results. There are several problems, of course. It’s possible that life has not begun in those underground seas in the 4.5 billion years they’ve been around. The chances are maybe 50-50 just because we know so little. It’s possible that life began in a very different way than it did in the inner solar system, making the findings a bit less valuable. It’s possible that the mission will not search correctly for evidence of life. We can’t figure out and equip a lander for every possibility. It’s possible that the spot where we look does not have, by chance, evidence that is plentiful elsewhere. Given all of the above, it’s a risky mission. The results, if successful, will be worth every bit of cost and risk. Just imagine knowing how life starts in chemical terms.